Dr. Radhika Iyengar is the Director of Education, Nigeria Scale-up Initiative at the Earth Institute, Columbia University. 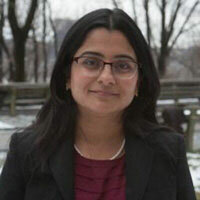 She received a distinction from Teachers College, Columbia University on her dissertation „Social Capital as a Determinant of Schooling in Rural India: A mixed methods study.“ She has a Master’s degree in Economics from the Delhi School of Economics, India. Previously, she was working in an India-based non-profit organization, Pratham, the largest educational movement in India. She continues to support NGOs in India by conducting technical capacity building workshops in India, as well as serving on the Board of advisors of NGOs affiliated with the Government of India working towards rural educational literacy and women’s empowerment. Her research interests include evaluation of educational programs and international educational development. She has also presented her dissertation in various conferences, including the Comparative International Education Society, and was awarded the New Scholars Fellowship-Comparative International Education Society for 2010.